Affectionately called Happyo, Ms. Happy Oasis is the author of Bliss Conscious Communication, the book that inspired Blissology University, and uncivilized ecstasies, ecstatic nomadic international adventure poetry about the joys of living beyond civilization. While enjoying an audacious, diversified, life, Happy has served as an adventure anthropologist, succulent strategist, ethical advisor, environmental advocate, community solutions leader, eco-entrepreneur, monastic meditation program director, inventor, architectural designer, non-profit festival producer, poet, performer, editor, volunteer at orphanages, refugee camps & tribal farms, show time naturalist & choreographer on the Princess Cruises Alaska Inside Passage routes, health and happiness consultant, mentor, international wild edible plants teacher and wilderness trekking guide. The inspiring story of Happy’s name was featured on Oprah. 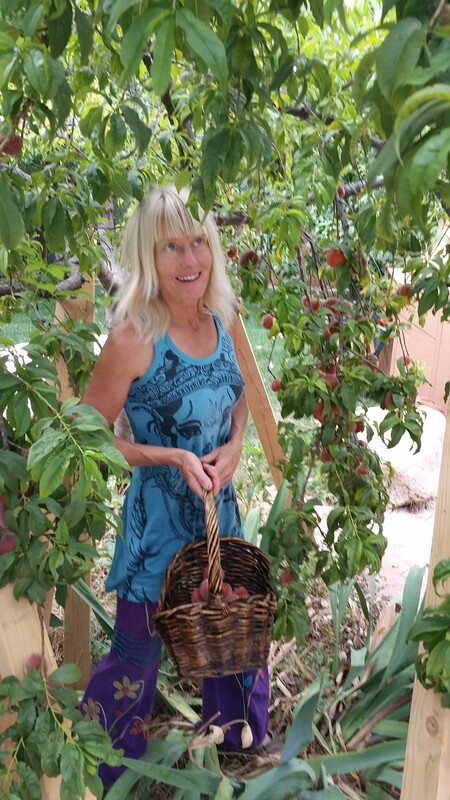 A nomadic ecstatic for 30+ years, Happy travels as a featured guest speaker at churches, colleges, synagogues, universities and spiritual centers, including her Heaven on Earth sanctuary situated in a luxuriant little known desert rainforest in a labyrinth of canyons in Northern Arizona. As an earth-advocate, human rights leader, sleep consultant, fitness friend, songwriter, circle singer, artist, linguist of tribal languages and blissologist, Happyo is at your service. I come from a place of joy and freedom. Geographically-speaking, I was born on a plain at the edge of a vast swamp. Sedona, Scottsdale, Maui, Ashland, and the Gorgeous Granite Dells comprise a few happy sweet homes.